I'm going to try to catch up on the past 11 months and get this going again. obviously, I've forgotten a lot of what we've done, but something is better than nothing! First, a quick run-down on the last weekend of March (which I forgot about earlier)... Jim and Diana stayed the night at our place on a Friday so that we could all go to Great America the next day - Lockheed had rented it out again for Employee Day. Unfortunately, it rained the ENTIRE day. We originally planned to get there at 10am, but, because of the rain, we went out to breakfast first. The rain only got worse, so we decided to do something else instead. And we hit a ton of failing options. First, we drove to the closest bowling alley from where we ate... only it was going to be FIFTY-SIX DOLLARS for the four of us to bowl ONE GAME. And this wasn't even laser bowling or anything... just plain 11am bowling! We walked right out and across the street to go ice skating instead. Sadly, open-skate didn't start until 2pm, due to lessons that morning. So, we went to the other end of the mall to look at movie times. Except, our friends had to catch a 2pm train back to the city and there weren't any movies starting in time for us to see. So, we walked the mall for a bit... nothing too exciting. We considered playing remote-control cars, but it was like $1/min/person and there was a wait. Jonathan and I kept thinking that the rain would let up and we would head to the park (it's the one only ten minutes from the house), but it never stopped for more than 20-30 minutes, so it would have been a disaster. Now, on to April! You may or may not know that we have a Major League Soccer team right around the corner - the San Jose Earthquakes. Now, I'd seen a national game before, but I still don't know a lot about soccer. Still, it was fun to go! We got our tickets through a Living Social deal (love those!) and found parking without too much of a problem. (It probably helped that the game was at a local University.) Our seats weren't the best, but they were fine for the casual fan. I actually thought that halftime was really neat - they had some martial arts demonstrations and even a lion dance! 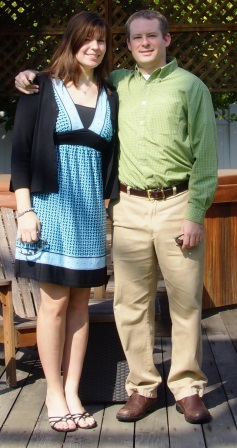 We had our annual Easter dinner, though it was just the two of us for the second year in a row. I made a ham with a cherry glaze. We're not sure what it was, but we both agreed that it was one of the best hams we've had in our lives, so that was fun. I also tried my hand at making mashed potatoes from scratch for the first time... it wasn't THAT much more work, but the result wasn't that much different, either. I was more excited about making green bean casserole (not normal Easter fare, but we both missed having it at Christmas), which I also made from scratch. I liked it a little more than Jonathan, and I definitely learned some tweaks for the future... for instance, I'd halve the cheese, cut the beans (I steamed fresh ones for the recipe rather than use canned), and add mushrooms (I didn't use canned soup, either... I made the sauce with butter, flour, sour cream, etc). I rounded out the meal with fresh rolls and red velvet cookies... the rolls turned out too heavy (they didn't rise too much the second time, so I think that was the problem) and the cookies were a bit dry (or, perhaps, red velvet is just better as cake!). Honestly, I was most proud of the fact that I pulled off a 2pm lunch after getting home from church and taking some Easter pictures, LoL! We celebrated our 12th anniversary as a couple at our favorite Mediterranean restaurant again, with us both ordering our favorite dishes. Then, we planned to spend the weekend camping at Pinnacles National Monument, about 90 minutes away. Unfortunately, they ended up being full when we arrived at 11am (they have walk-up tent sites), so we just spent a day there instead. It was still pretty neat to explore the Talus Caves (we'll save the Balconies Caves for another day! ), see the reservoir, and hike a few trails. The high was around 60, so it wasn't too cold... the low was in the 30s, though, so maybe it was a good thing that they didn't have any sites left! On our way home we stopped for BBQ in Hollister - not the best, and the sauce was a little vinegary for our liking, but give Maverick's a try if you're there!